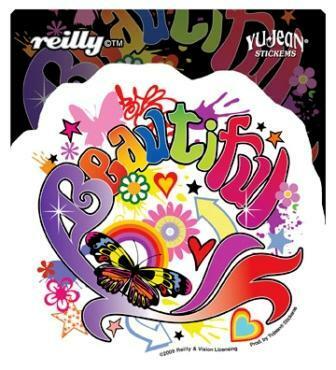 Designed by the artist Reilly, this sticker is graffiti-styled and steeped in creativity, this "Beautiful" design has pop culture written all over it. From the stars and paint splats, to the butterfly, hearts and flowers, it's a beautiful thing! Approximate size is 4"w x 4"h die cut sticker. The sticker is weather-resistant, and is extra long-lasting.